Many people discover that booking Broadway travel group tickets in New York is a complex and costly venture. The stories will likely be even scarier if they tried to keep their group seated tighter when purchasing Broadway theatre party tickets. Even if tickets can be found at the box office, the show times are likely to be at times that aren't convenient, which doesn't work if you're making arrangements for Broadway corporate group tickets. Why deal with this discouragement when the helpful experts at Great White Way are able to hook you up with seats at the most popular shows at prices you'll find reasonable. When organizing for a church trip to New York, you might not know the numerous plays and musicals showing at Broadway theaters. This can be a problem if you need to be sure the Broadway church group tickets you're reserving are for a show which is well-suited for everybody in your group. 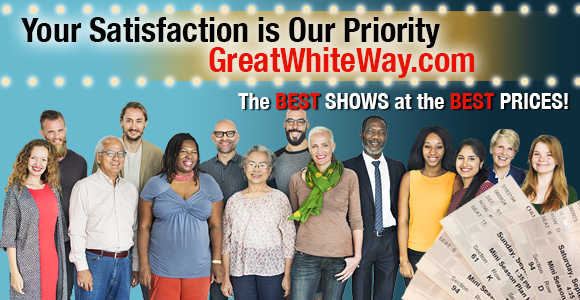 The ticket brokers at Great White Way are familiar with the information regarding the productions currently running on Broadway, so they're able to make recommendations for the shows everyone in your group will enjoy. In addition, they can assist you in finding tickets to early showtimes, which have a tendency to be less costly than evening shows. 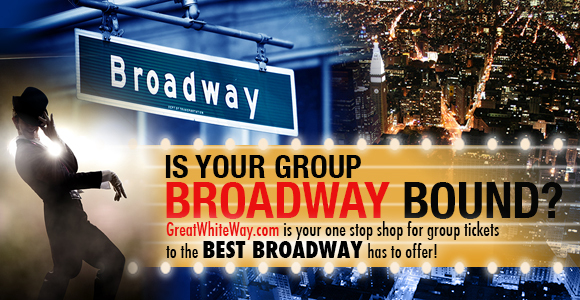 Our staff at Great White Way makes reserving Broadway tour group tickets in New York easy and affordable. 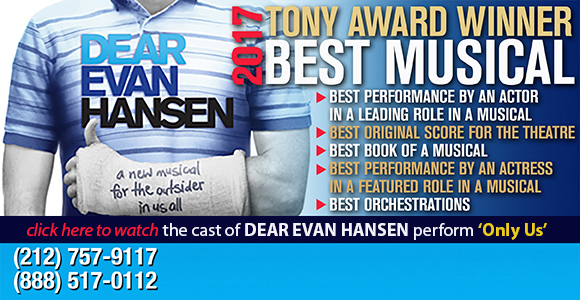 A terrific way to celebrate closing a big deal or to entertain visiting business associates is to arrange for your group to experience a Tony award winning Broadway show. The downside of this plan is the time it takes to find Broadway corporate group tickets for these frequently sold out shows. For immediate access to the most popular Broadway theatre party group tickets in New York City, you can count on our resourceful ticket brokers at Great White Way. 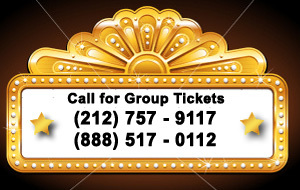 Our staff makes obtaining even Broadway theatre party group tickets simple and convenient. 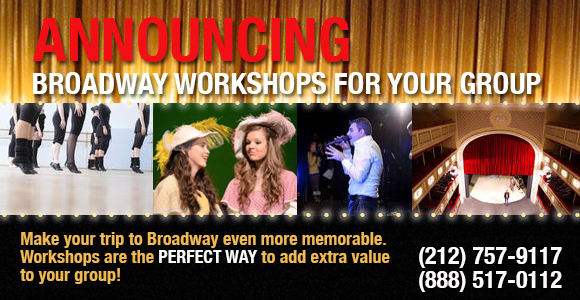 Call one of Great White Way's Broadway theatre party group tickets pros if you're considering having your school or youth group experience the magic of Broadway theatre. Not only will you find that a large number of theatres provide special student discounts for matinee performances, but several even go so far as to supply workbooks, videos and other educational materials for your group ahead of the show. These materials help youth understand the behavioral expectations related to attending a Broadway performance, together with to know what to anticipate on stage and in the theatre while the performance is going on. By calling us for Broadway theatre group tickets in New York we can even assist you in finding performances where you can possibly even meet the cast and crew afterwards. In some cases when making arrangements for group tickets for young people, we're able to arrange complimentary tickets for the chaperones. Call Great White Way today to learn more. If you purchase Broadway theatre party tickets in New York, there are additional perks which a lot of people aren't aware of. If you're purchasing twenty tickets or more, some groups gain access to special opportunities that could include special pricing or even meeting the cast and production crew for 30 to 60 minutes after the show. Such special events after the show need to be arranged well in advance because the actors and crew participate on a volunteer basis. 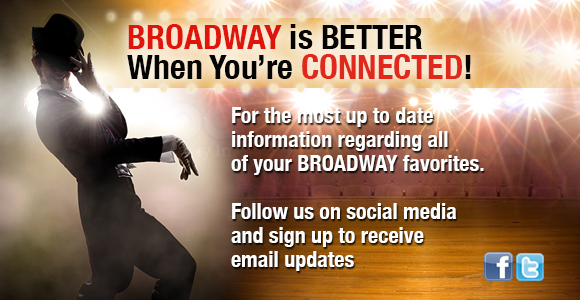 Should this be something your group may be interested in, be sure to let our Broadway ticket concierge know as our employees are experts in Broadway group tickets in NYC. A Great White Way representative is going to be able to not only make the necessary arrangements, but also let you know if there are any required donations for the cast and production crew's time. 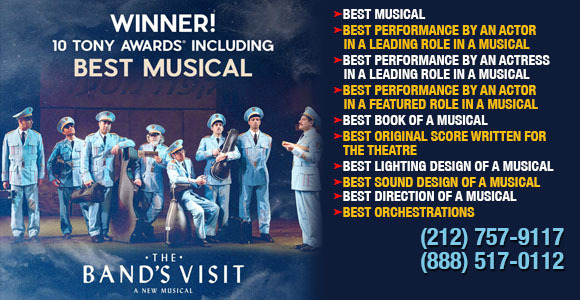 Our Broadway group ticket concierges are additionally going to be able to help you with making arrangements for dinner in addition to making reservations for hotels in the theatre district. At Great White Way, our goal is to make certain you have the absolute best Broadway theatre experience you could possibly have. To turn the stress of booking Broadway corporate group tickets in New York at the box office into a pleasant dream, take advantage of the expertise of our staff at Great White Way. Contact us right away at (212) 757-9117 for the finest seats in the house.